How to combine PDF files into a TIFF image? 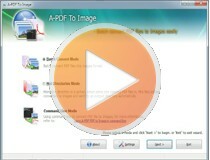 Which PDF converter combines many PDF files to a single TIFF image? A-PDF To Image (free download here) is a good choice. The program converts PDF files to images, the image formats contain JPEG, PNG, GIF and TIFF. And you can create single-image TIFF based on multiple PDF files. Click "Convert" to output PDF pages to separate folders images.